It’s that exciting time of year when economists wake from their summer slumber and start making submissions to the federal Finance Committee about what they’d like to see in Budget 2018. So what would a feminist budget look like? Here are few things I’d like to see under the budget tree this year. Men and women tend to work in different jobs in Canada. Moving women into predominantly male employment sectors may pay off for women in the longer term, but the rate of change is slow. Like, generational. Worse yet, research has shown that as the share of women in a field increases, the value placed on that work diminishes. That means Budget 2018 needs to invest in the sectors where women are working today. More than one out of every five women in the labour force works in health and social services. Not construction (12% women). Women work in jobs that accommodate their unpaid work (particularly childcare), thus nursing, teaching and service industry jobs continue to be among those where women are most likely to be employed. We need job stimulus for the entire labour force, not just 53% of it. The occupations in which women are most likely to work include some of the lowest-paying jobs in Canada. For example, women in skilled trades are most likely to work in food service and cosmetology, while men are most likely to be plumbers and electricians. Apprenticeships for all these trades require equivalent levels education, experience and skill, yet the average full-time wage for a cook is just under $29,000 and for a hairstylist it is $22,000. Contrast this to the average full-time wage for a plumber, which is $55,000, or for an electrician, which is $60,000 annually. The government has promised to spend $3 billion in home care in the next three years. While this will certainly create jobs in a predominantly female job sector, the median take-home pay for a home care worker ($18,942) falls below the Low-Income Measure. Instituting a living wage for home care workers would make a good start to ensuring that working women aren’t living in poverty. Women are twice as likely as men to work part-time. 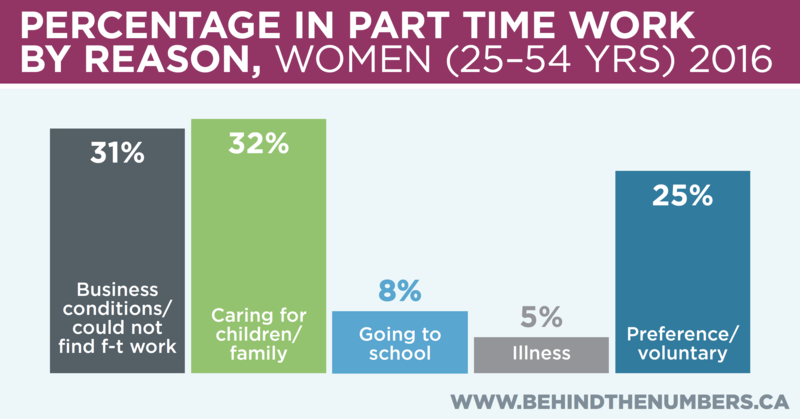 The majority of those women (63%) are involuntary part-time workers. Half of those involuntary part-time workers cite childcare as the reason they are not in full-time work and half cite business conditions. The share of women who cite business conditions as the reason for part time work suggests that we are lacking both sufficient investment in the sectors where women work and that it is employers, not female workers, who need further incentives to lean in. Women perform 10 more hours of unpaid work per week than do men. They perform more total hours of work (paid and unpaid) than do men. (But who’s counting?) The disproportionate share, particularly of childcare, limits the number of hours available to women to do paid work. It also makes it more difficult for women to enter occupations with non-traditional or inflexible hours. You know, like politics. Affordable and accessible childcare is essential to shifting the balance of unpaid work for women. However, stand-alone paternity leave has also been demonstrated to play an important role in redistributing hours of unpaid work. The Quebec Parental Insurance Program, which provides 5 weeks of ‘father only’ leave has resulted in 78% of men now taking parental leave in Quebec, compared to 27% in the rest of Canada. Or maybe men in Quebec just love their children more? (I don’t think so). It isn’t just me; research has demonstrated that women’s organizations make an essential contribution to ensuring that public policy works for women. Yet federal funding to women’s organizations has actually decreased under the current government. 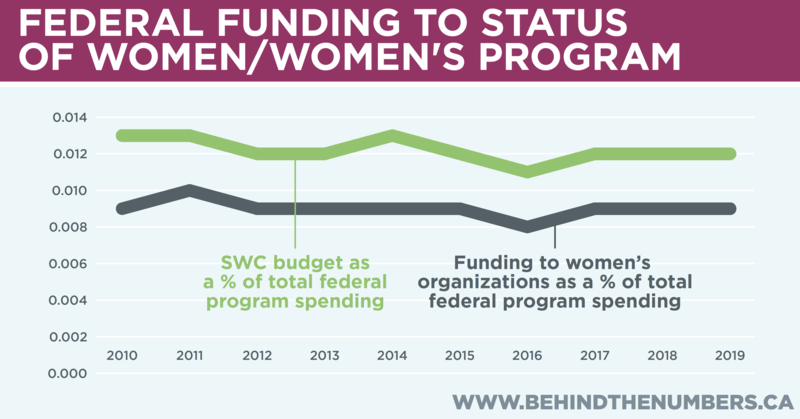 That direct federal funding of women’s organizations continues to represent a miniscule proportion of the budget – less than one one-hundredth of one percent of total federal program spending. I like to point this out every time I find myself sitting at a table in a Government of Canada building with a group of women’s organizations offering (free) expertise and research. Consultation is great, if you have someone to consult with. Under-employing and underpaying women is costing women and the economy billions of dollars annually. The International Monetary Fund estimates that if the employment gap between men and women were closed, our GDP could go up by 4%. If the 670,000 women who were working part-time for non-voluntary reasons in 2016 were able to find full-time work, they would have brought home an additional $19.2 billion in wages. If the women who worked full-time last year earned the same hourly wage that their full-time male counterparts earned, they would have taken home an additional $42 billion. The 2017 Federal Budget gender statement was an important first step in making the most of both halves of Canada’s labour force. However, core economic policies need to address the fact that men and women work in different occupations, at different rates of pay, for different numbers of hours. Moreover, targeted policies need to address the additional barriers that face Indigenous women, women with disabilities, immigrant and racialized women – all of whom see larger than average gaps in pay and employment. The women are out there. They are educated and in the labour force. Don’t make them the keepers of their own disadvantage. They don’t create hostile work environments; they don’t discount their own pay; they don’t set childcare fees. Women need their governments and employers help in removing these barriers. Time to start leaning in gentlemen. Are we in recession? Why do we need job stimulus for any part of the labour force? With no mention of the cost for government to intervene in labour markets to bring this about. I wonder if this figure is based on comparing the pay gap between actual counterparts (since roughly 15 to 25% of the gender pay gap cannot be accounted for by economic differences and might well be due to discrimination), or if it ignores the fact that 75 to 85% of the pay gap is explainable. Compared to Indigenous men, men with disabilities, immigrant and racialized men? Citation needed. 1. You are correct, Canada is not in a recession. However, Canada is in a period of slow growth, both nationally and globally. This is a cause for concern – concern which you will see expressed in economic forecasts from the federal government, Canadian banks and international financial institutions like the IMF. 2. If supply and demand was the sole determinant wages we would have a lot of underpaid lawyers running around. Education is also one of the key determinants of wages. This is why it is notable that groups with similar education earn different wages. Further the correlation between the share of women in an occupation and lower wages is strong, across the economy and across high income countries. Moreover, as the share of women in an occupation increases wages stagnate or decrease. The change in wages in that specific occupation can’t be explained by supply and demand. I would also note that addressing the wage gap would benefit women and men both — as they do tend to live together. Household budgets have already benefited from the increase in women’s participation in paid work, helping them keep pace with rising costs of living in a period when male wages were stagnant. With high household debt, increasing the incomes of families is important for the whole family. 4. Analysis of the gap in wages of men and women from racialized, indigenous and immigrant groups can be found here: https://www.policyalternatives.ca/publications/reports/narrowing-gap Identifying discrimination for one group doesn’t mean ruling it out for others. It is clear that indigenous men, for example, face significant gaps in wages and employment compared to non-indigenous men with the same education, in the same occupation. The recent IMF report (link above) also provides analysis that concludes that the net cost to the government of introducing more affordable childcare (a key lever for increased female labour force participation) is nil. Canadian economist Pierre Fortin has published a number of analysis that demonstrate the same thing, using the Quebec program as a case study. 1. Assuming some economic stimulus is called for in order to increase GDP, how would directing spending at female-dominated sectors be an improvement over directing that spending at the projects with the highest fiscal multipliers? 2. The supply of experienced lawyers in various specialties is fairly inelastic, and there are many unmet legal needs in society, owing to the high cost of hiring lawyers. If lawyers were fungible no doubt they would all make far less, but they are not. Is it really, though? Within the group of all lawyers some make quite a lot more than others, despite having very similar educations, and this is not considered remarkable. Let’s define a group with less educational similarity than the group of all lawyers, say, the group of all people with bachelor’s degrees. Wouldn’t you expect even more wage variability, given that this group includes both engineers and english majors? What does it mean for education in two different fields to be similar, or equivalent? You give the example of hairstylists and electricians. Their similarity is that they are both trades. Do programs that prepare for those occupations have the same or similar availability, acceptance criteria, time required to complete, tuition cost, workload, difficulty of subject matter? 3. / 5. If the cost to the government of introducing more affordable childcare is nil, how far is that expected to close the employment gap? How much additional money would women earn in that scenario? If you’re going to say, closing the employment gap *completely* would net women this many additional billions of dollars, then I want to know what the cost is to close that gap *completely*. The point here is that in the context of wage / employment gaps, it costs nothing to advocate for racialized, indigenous, and immigrant people of both genders, at the same time. Is this based on the full gap or the unexplained gap?